Coal mining has many serious hazards, and the spontaneous combustion phenomenon is one of them. Many factors can influence the tendency for occurrence of this phenomenon. The maceral content is one of the coal inherent characteristics, which has a crucial aspect in the occurrence of this process. Until now, this parameter has not been discussed in a comprehensive study by the scientists. Thus a final conclusion about the effect of maceral content on spontaneous coal combustion is required. Maceral content is directly affected by the growth of coalification and origin of coal formation. 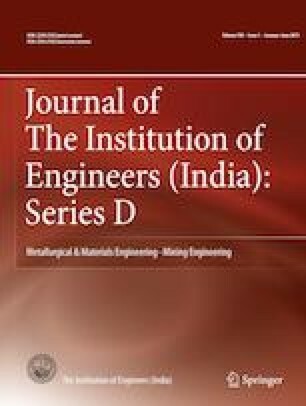 This study aimed at developing a new statistical model for predicting the spontaneous coal combustion tendency based on the maceral content. In this work, firstly, 51 coal samples with a variety of maceral contents were collected for training data of the overall underground coal fields in Iran, and the Crossing Point Temperature (CPT) test was carried out on each coal sample. Then the method of regression analysis was used for modeling and predicting the spontaneous coal combustion tendency. For validation and testing, 11 coal samples of another coalfield were collected, the CPT test was carried out on each one of them, and the results obtained were compared using the regression equation. Validation of the developed model was checked by the F test. By examining the experimental results and comparing the CPT test values, it was found that with increase in the vitrinite and liptinite contents and decrease in the inertinite content, the coal samples displayed a higher tendency for spontaneous combustion. The results also showed that the spontaneous combustion tendency could be reliably predicted using the proposed model.